Now available online, new pieces from the Péro by Aneeth Arora Resort 2018 collection. We received pieces made from silk in navy blue with pastel yellow and pink floral prints. The two prints, different from the previous shipment, are florals in detailed clusters or larger with less detail. 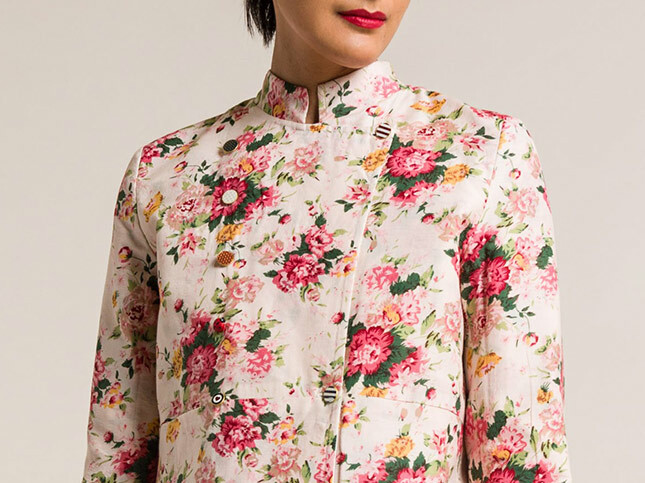 A standout pieces from the shipment is the reversible white to floral pink coat, which is a new color from previous shipment. From handmade details, such as beaded flower tassels and embroidered ladybugs, to elegant ladder-stitching and lace hems, all Péro pieces are filled with special surprises.